Complete the game in Charming Difficulty. Complete the game in Grimm Difficulty. Complete all 20 missions of the game for the first time in any difficulty. Complete 33% of the Challenge Quests in the game. Complete 66% of the Challenge Quests in the game. Complete all the Challenge Quests in the game. Launch 50 Enemies into the air then catch them with Shrek. 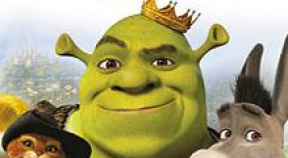 Use Super Ogre Power 5 times with Shrek or Fiona. Defeat the Ice Dragon. (Normal Difficulty or higher). Defeat Captain Hook. (Normal Difficulty or higher). Defeat Prince Charming. (Normal Difficulty or higher). Complete all of The Collector series of quests. Use Super Ogre Power 10 times with any character. Use Fairy Dust Attack 50 times with any character.